Any attempt to understand and valorize the rise and decline of the Anti-Fascist Women’s Front in Yugoslavia (AFŽ) today is faced with the question of how to read and comprehend the organization’s archive. The problem is broader, however, and has to do not only with the AFŽ archive, but also with the archive as an institution that enables contemporaneity through a critical view into the past, as it appears precisely in the archives (where they exist) that constitute history as such.1 The AFŽ was formed in 1942 during the Second World War [and is the result of long-term attempts to mobilize and organize women within the Communist Party of Yugoslavia (CPY), when the leaders of the people and the nascent state were faced with difficult and urgent organizational and political questions. The AFŽ integrated itself into the tradition of the international socialist movement, which, from the 1930s onwards, developed the idea of a Popular front as a response to the fascist mobilization and rise to power. Tremendous physical effort is imbued into the AFŽ’s history, first and foremost in organizing the resistance against the local collaborators and the foreign occupation forces, followed by the post-war reconstruction of the country and the formation of the state structures. The history of the AFŽ, however, bears witness to the dynamic convergence between strong social organizations and ideas and masses of ‘common’ and ‘small’ women, who together with their male comrades created Yugoslav history. Though this history continues to live as a memory of the few, the reconstruction of such a convergence is made rather difficult by the intricate historical developments, the mutation of our political glossary and the abandonment of previous socio-political formations. Some of the basic insights of the more recent critical and feminist insights into the women’s history (especially those relating to the questions of patriarchy’s historic character and the effect of such a construct on the writing of history) can help with the reconstruction. The pioneering return to this unwritten history undertaken by Lydia Sklevicky is based precisely on this perspective insisting on the fundamental importance of the content of the women’s question.2 Analyzing different understandings of the idea of continuity within historiography and history, anthropologist Svetlana Slapšak notes that the idea of “continuity which in historiography does not have a very good position given that it is often used as a tool of nationalist imaginaries, in women’s history means something else. It is inscribed into a socio-cultural formation which we known for a long time now, whose real origins are almost unknown, and which still cannot be classified as the past – the patriarchy“. The present and the AFŽ are thus related precisely by this particular continuity, given that “it has no connection to ethnic mapping, it cannot be aligned with a religious conglomerate or an ideology”. 3. From this perspective, the AFŽ’s organizational history, its internal relations as well as relations toward other elements of the nascent society can be reconstructed as a reconstitution of patriarchal culture. This leaves us with the question of how to understand the history of the abovementioned continuity despite the AFŽ. 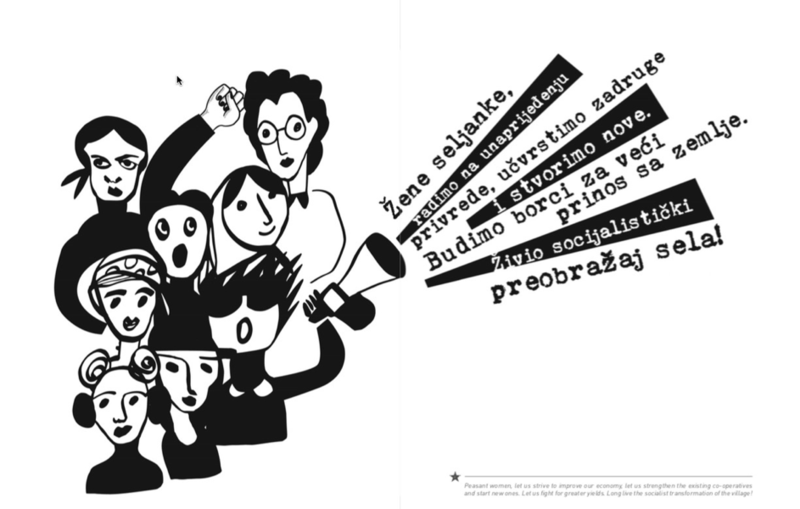 More recent debates on the AFŽ analyze the way and the extent to which the traditions of socialism and feminism collide and are expressed and combined in the history of the organization. Maca Gržetić, in her speech at the first Congress of the AFŽ Croatia in July of 1945, emphasized that women were “doubly unfree and as twice as oppressed until the victory of the People’s Liberation Movement (NOP) in our country”. Although it is hard to pinpoint what exactly she was referring to, we can assume that she had important questions regarding the two traditions in mind. Unfortunately, the idea of double unfreedom, as a criterion that could serve as an indicator of the real freedom of women, was never examined seriously, hence there was no plan for a double liberation.4 After the war, the AFŽ is strongly integrated into the new order led by the Party as the ruling societal power which considers the woman question as subordinate to the general goals of the Party.5 Thus the Party, at least in principle, considered that the woman question would be solved through a progressive realization of the popular socialist rule. Given that even the AFŽ, almost without exception, advocated this position, the important question arises as to how one of the two constituent intellectual traditions embodied in the movement was eliminated and whether the archive can tell us something about that. Over a relatively unique and long historical period, the AFŽ was ensuring, in a most direct way, the social and economic reproduction of society and the new social order through constant reproductive work and unpaid public work on a massive scale. This leads us to the second, fundamental question: what is to be gained from returning to this organization and its epoch today when our participation in society is reduced more and more to individual labor on the market valorized in monetary terms only, while patriarchal oppression remains deeply structured in hybrid physical, transitional and digitally mediated spaces? Can it point us to some significant questions and can it teach us anything? In order to at least touch upon some of these questions, in this paper I focus on the post-war period until the abolition of the AFŽ (1953). My ambition is to at least partially reconstruct the dynamics of the creation of the heroic figure. My thesis (and my hope) here is that a return to this path – a return to the female in constructing the heroic – can outline a new heroic figure that could intervene into the present as an emancipatory figure. Something of this “figure that is coming” can be discovered through an open, critical and creative return to collective action, which has already been exemplified in our history. The dispositive is a useful analytical tool as it enables us to have an all-encompassing view of the set of social and political relations that play a constitutive role in the formation of a society. In a general sense we can understand it as a strategic formation that responds to small or large scale needs. Foucault defines the dispositive as a “heterogeneous collection consisting of discourses, institutions, architectural forms, regulatory decisions, laws, administrative measures, scientific statements, philosophical, moral and philanthropic attitudes, in short that which is said as well as that which is left unsaid […] the dispositive is a system of relations that can be established among these elements.”10 Relying on Foucault’s definition, Giorgio Agamben defines the dispositive as “a set of practices and mechanisms (both linguistic and non-linguistic, juridical, technical and military) aiming to face an urgent need and to obtain an effect that is more or less immediate”11 The dispositive thus at the same time encompasses a set of practices and a set of institutions and their respective discourses as well as their linkages that structure the relations within each individual sphere of action. It includes biological and bodily, conceptual, material and institutional efforts to construct a socialist world as a new world, which in practice are realized as the work of organizations and institutions committed to structuring the relations of material construction of society, and its conceptual foundation. Thus we can interpret the project of creating socialist Yugoslavia as a dynamic construction of the socialist dispositive whose task it is to organize the newly established labor, political, and production relations. It is within this strategic space that the AFŽ is developed as a distinct element that, in a given historical moment, articulates itself as a response to a specific and urgent need for the creation of a new society. The general process of dispositive construction operates, from its very beginning, with one significant figure around which it seeks to organize societal energy: the figure of the hero. Historically, the figure of the hero was usually associated with the imaginary and praxis of war, although some traditions developed on somewhat different principles. Up until the French Revolution, the figure of the hero as an individual “warrior” predominated, but was replaced by the democratic and collective figure of the soldier in the revolution12. Badiou believes that “our task is to find a new heroic figure, which is neither the return of the old figure of religious or national sacrifice, nor the nihilistic figure of the last man” which should be a “paradigm of heroism from beyond war, a figure that would be neither that of the warrior nor that of the soldier.”13. All socialist projects, to a lesser or greater degree, were attempts to connect the figure of the hero with labor as a process, and thus establish heroism of labor as the most important societal value. Yugoslavia’s history, especially the early years of the second Yugoslavia, is a history of one such attempt. During this period, a demand was repeatedly made for heroism as a unifying signifier that should directed the efforts to create a new society. It was an important element of “anthropotechnology”, the general task of which is to educate in a predefined manner. The economic model was simple: “electrification and industrialization”, however, Vlaisavljević claims that things were much subtler. According to him, the basic element of the transformation upon which a new society was built was in fact an epistemological revolution that was realized as a “technological revolution which in its ‘real essence’ was an industrial revolution”, and even though it was realized “with power-lines and columns reaching to the remotest villages”, in another sense it was actualized as a discourse “that described a new human and technological reality, while having an educational effect”14. Anthropotechnology, as the knowledge of “technology of liberation”, as a technological solution to societal labor as the basic mechanism of the production of people, in a general sense includes material construction of the human world, as well as the processes of proper upbringing of humans. Here one must seek an explanation for the relatively quick abandonment of mass-organizational forms – especially in the case of women’s organizing – which then determined the general character of the political and economic development of the new state in a period of tumultuous post-war consolidation. Through the NF, the people issued a general demand to the people to take up work on a voluntary basis and to push themselves to the limit. Here it is important to point to the ambiguous position of the Narodni Front of Yugoslavia and the AFŽ, which, according to Lydia Sklevicky, unites the positions of the order in whose name it acts. Organizational discourse was deeply integrated into the régime’s narrative structures, and at the same time it discovered their clash with the social reality of the position of women, which articulated itself through the real connections inherent in movements, especially those movements whose main aim is massification. This dual position points to a very specific configuration of power and control. It consists of societal forces that consolidated the leading role of the Party and the real political experience of countrywide mobilization of the movement. The Party eliminated the basic political question of the structure of governance and took on the task of directing general social development as economic, while removing the question of power from the equation of the new social contract.22 Although the history of Yugoslavia would still be marked by various articulations of the national and workers’ question, the “economic base” remained the main focus of the efforts to create social and political structures. In 1946, general competition was introduced, that was transformed into a “mass movement, comprising 60% of workers and civil servants.”23 Although today it is difficult to understand the scope and character of such a mass mobilization, it represented a turning point in the creation of Yugoslav society. The majority of the population was rural, while workers made up a much smaller portion of the population. The country received limited influx of funds and donations in goods; however “in a devastated country, facing general shortages and extinguished foreign trade – the mobilization of the masses [was] the only means of reconstruction.”24 An important example is the mass mobilization of youth. The youth movement emerged from the war with a vast legacy of direct participation in combat, and thanks to this a considerable number of leadership positions were occupied by young people. Continuity was established between fighting in the war and the reconstruction of the country; the reconstruction was “an essential […] part of the great fight on the battlefield where tens of thousands of young men and women lost their lives”. With the formal post-war establishment of the youth movement at the First Congress of the United Alliance of the Anti-Fascist Youth of Bosnia and Herzegovina held in Sarajevo from April 6-9 1945 the youth joined the competition. Here we can still see a very firmly articulated idea of mass socialism, as well as hints of something we may call the idea of the mass state along with a somewhat limited role of the Party. The developments, however, took a different direction: after the transformation of 1950, when the economy was organized on more and more original and newly-established principles, mass organization started to fade as the basic element of social development. The dispositive is never a homogenous field, but is rather constructed at the intersection of societal forces that affirm and question it. This is particularly visible in Yugoslavia after the Second World War where Chetnik and Ustasha forces were still operational, individual’s participation in the war was being checked and verified, the figure of the people was strengthened and the basic institutional structure of the new state was built. The flipside of this process were the objective circumstances in which an attempt was made to realize certain material and symbolic goals. The construction of Yugoslav socialism, until June 1948, was based on close practical and theoretical relations with the USSR headed by Stalin. Thus the early post-war period mainly consisted of practical activities aimed at establishing a Soviet model with two basic aspects: state-ownership and central planning, which was to be effected by a range of economic and administrative measures such as price control, limitations on free trade, fixed rent and wages, organized supply system, etc. What was happening with the organization of women during these turbulent times? After its foundation in 1942, the AFŽ focused on organizing women activists, whose tasks mainly had to do with war-related activities. The AFŽ “sprang up from the people’s anti-fascist movement organized and led by the CPY”;. its edifying work “in the spirit of the Anti-Fascist Front’s program“ put “thousands and thousands of women in the vanguard of the fight against fascism.”36 As of 1944, the organization focused on recruiting new members on a mass scale, abandoning its original activist orientation. Thus the AFŽ, along with other large voluntary associations, joined the mass voluntary movement to reconstruct post-war Yugoslavia and puts in thousands of hours of voluntary labor. Lydia Sklevicky places the first three into the category of “frontline goals”, whereas the other two she labels as specifically women’s tasks, as they consist of “the socialization of [women’s] reproductive labor.”38 However, one must not overlook the fact that the general goals, in the long-term, were only achievable if the specifically women’s goals were achieved. How else could one secure the intergenerational transmission of the changed attitude towards labor and the lesson of brotherhood and unity – which was supposed to secure the people’s rule? Here we see the complexity of the women’s task. New shock work was to complete difficult specific tasks, care for a large population of children, bring society to literacy, but also mobilize the masses without losing sight of the basic edification goals. There it is, a direct call to heroic engagement that gives to society the greatest possible gift, the gift of heroism, the gift of life. It establishes a paradigm that needs to be infused with different content, one that transcends its origin in the heroic war sacrifice and establishes something different. Determined to do the best they can, women created a “new form of heroism.” It was a heroism that was not like a “rank” that could have been awarded to one woman or one man who could carry it like a medal. It was an effort for the community, a collective heroism built on a mass effort of voluntary labor that worked thousands of bodies to exhaustion before it faced the fact that the set goals were unattainable precisely because they were of heroic proportions, because they implied that one could always work more, harder. Only in a mass effort was it possible to produce the super-human, the heroic – as only the heroic was worthy of the heroically fallen heroes. Here we find the basic lesson of the dispositive as the technology of the social: labor will transform society, and in order to truly transform it, we need to work heroically. How was the AFŽ affected by the wider socio-economic transformation that started with the conflict with the Soviet Union and the opening towards the West that would later considerably influence the foreign policy position as well as the position within the international economic relations?52 In the internal CPY discussions on the AFŽ (during 1947/48), the opinion that a unique women’s organization was needed prevailed, but the question of “how and through which organizational forms [to] connect the revolutionary power of women with the power of the working class and the people as a whole, with the aim of their complete liberation”53 was also raised. The CPY defined the NF as the main political power, transferring the woman question to the NF, while within the CPY committees for work with women were abolished. In practice, the NF was, for the most part, never too concerned with the woman question, which created an open space for the political work of the AFŽ. Previous work was critically evaluated: “We have degraded the woman activists to the level of an errand girl, when we should have elevated her to the role of a political leader.”57 And there we have it, a yardstick of the organization’s success: a woman as a political leader. This points to the character of the loss the end of this organization represented. It is a known fact that the bulk of the AFŽ’s work was directed towards rural areas, especially in Bosnia and Herzegovina, which remained predominantly rural long after the war. In rural areas, the AFŽ undoubtedly presented an avant-garde platform that offered for the first time in the (women’s) history of this region a possibility to imagine something like a collective women’s political subject formed through “gathering” and talking about “[women’s]” things. Once this platform, the space for gathering and opening up possibilities to speak about creative possibilities of self-definition and collective action was lost as well. Thus the form that women’s organizing took after the war should be viewed as an attempt to answer the urgent call to organize society by reformulating labor and gender relations in a specific historical moment. In the earliest stages of the effort to build socialism, the AFŽ, along with other organizations that were part of the NOM, was established as an element of a broad, general struggle headed by the CPY. In the post-war period, its edifying role came to the fore. Faced with a demand for heroism, the women’s organization took on the general educational and edifying role, as well as the general task of organizing work with women, on the ground of the mass social mobilization. Some materials point to a particular dimension of autonomy that did not belong to the organization as a structure made up of committees, but rather to the women who, with the help of the organization, created a space that made possible at least a fragile path towards emancipation, if not true emancipation itself. This is certainly one of the farthest-reaching consequences of the organization’s dissolution, as it led to the disappearance of an open space for women’s political organizing that contained the possibility of a double liberation. The dissolution also led to the disappearance of the only possible arena and the only possible form of women’s activity. A partial insight into this historical era of the women’s movement can help us better understand the convoluted web of instructions that contain today’s labor and gender policies. The Heroic remained an important signifier of socialism for a long time. It would be necessary to trace its construction even after 1953 and describe the transition, completely expected from the point of view of socialism’s technological paradigm and the theoretical evolution of its bearers and leaders, from mass-heroism to the next form of the heroic, in which the collective effort of the masses is substituted with biotechnological labor of self-managed companies and corporations.68 It should be determined if the connection with the original heroic acts was maintained, and if so, how. The practice of naming factories and institutions after people’s heroes indicates that it was, and that there was an effort to homogenize the material progress and transition are within the same horizon. It can be assumed that heroism was supposed to act as binding tissue connecting the heroic of the (woman) soldier, the heroic of the masses, and modern industrial collectives. The question remains how effective this binding was, and for how long. It points to the fact that socialism in the second Yugoslavia failed to emancipate the heroic from the soldier-warrior figure. The heroic figure that witnessed the dissolution of Yugoslavia was already spent. In a certain sense, when it comes to industrial heroism, worthy of the heroic were ultimately only those self-managed collectives that “employ and do good business”. Here we find ourselves faced with a completely transfigured picture of individual heroes whose acts and deeds are no longer in their hands. Instead, the heroic intention must adapt to the powers of the market, successes and failures in the market competition. Today, this figure, too, is a thing of the past; successful companies are respected, but not as collective projects of hundreds of thousands of workers, but rather as manifestations of the entrepreneurial vision of owners and managers. Heroes constructed after the bloody and complicated dissolution of Yugoslavia are again exclusively heroes of war, heroes of defeats and victories on the battlefield, not heroes of agriculture or industry. The end of Yugoslavia brought about total privatization of labor and production relations, the privatization of ownership and management, executed as the adoption and institutionalization of the Western model, and the process is still ongoing. This transformation was (and still is) accompanied by a discursive superstructure that reinterprets labor as a means for producing a society into labor as a disciplinary technique of bodies, a mechanism transforming us individually into capital, forcing us to adopt the changed conditions and means of labor, supply and demand, as well as organizational innovations. Is it then possible, under such conditions, at least roughly to outline some new heroic figure? What kind of heroic labor would it entail? Work collectives are less and less sources of pride, and dynamic elements of one’s identity, and are increasingly seen as despised places of everyday exploitation (unless they are former giant state-owned companies that were destroyed or split up leaving behind not only misery and decay, but also complex identity-related consequences which are yet to be analyzed). There is no doubt that the heroic, that which can respond to the urgent challenges of today that threaten to consume not only human life, but also the conditions for it, must be created through a collective effort – for which we lack a name and a format. This reveals the difficulty of the task faced by all who dream of liberation. Undoubtedly, liberation must include the liberation of women, which may be the only thing that can make possible for us to name and initiate a project of universal liberation. The name and description of such a project, along with the outlines of a new heroic figure can only come from the future, to paraphrase Marx’s famous words, but a collective effort of the future can only be launched as an act of facing up to the forces of the present. 1. ↑ Parikka, Jussi. “Archival Media Theory An Introduction to Wolfgang Ernst’s Media Archaeology” in Wolfgang Ernst, Digital Memory and the Archive, ed. Jussi Parikka, Minneapolis/London: University of Minnesota Press, 2013., p. 7. 2. ↑ Sklevicky, Lydia. Konji, žene, ratovi, ed. Dunja Rihtman Auguštin. Zagreb: Ženska infoteka, 1996. 3. ↑ Slapšak, Svetlana. “Balkanske žene: rod, epistemologija i istorijska antropologija“, ed. Babić-Avdispahić, Jasminka, Bakšić-Muftić, Jasna, and Vlaisavljević, Ugo. Sarajevo: Centar za interdisciplinarne postdiplomske studije, 2009. p. 63. 4. ↑ Sklevicky, 98, 107-108. 5. ↑ Jancar-Webster, Barbara. Women and Revolution in Yugoslavia: 1941 – 1945, Denver: Arden Press, 1990. p. 20. 6. ↑ Zaharijević, Adriana. “Fusnota u globalnoj istoriji: Kako se može čitati istorija jugoslovenskog feminizma?” Sociologija 57:1 (2015), 76. However, Zaharijević adds: “Yet it was within that same order, in the moment when the socialist arrangement based itself self-consciously on an even more fundamental equality in self-management, that the independence of the woman question was abolished. From that moment onwards it was treated as an integral part of the class question, which is a key issue of society, an issue that all other issues could be reduced to.” See the debate initiated by Nanette Funk’s text: ‘A very tangled knot: Official state socialist women’s organizations, women’s agency and feminism in Eastern European state socialism’, European Journal of Women’s Studies, 21, No. 4 (2014): 344-360; and the response to this text in Aspasia, The International Yearbook of Central, Eastern, and Southeastern European Women’s and Gender History: Is ‘Communist Feminism’ a Contradictio in Terminis? 1 (2007); Ten Years After: Communism and Feminism Revisited, 10, 2016. 7. ↑ Badiou, Alain. Philosophy for Militants, New York/London: Verso, 2012., p. 42 – 47. 8. ↑ Vlaisavljević, Ugo. Lepoglava i univerzitet – Ogledi iz političke epistemologije, Sarajevo: Centar za interdisciplinarne postdiplomske studije, 2003. 9. ↑ The Archival corpus is part of the Archive of Bosnia and Herzegovina in Sarajevo. The Archive was digitized between 2013 and 2015 by Crvena, while part of the archive was made available at: www.afzarhiv.org. 10. ↑ We can find this “definition” in the translator’s note in the Serbian edition of Michel Foucalt’s The Will to Knowledge – History of Sexuality (Mišel Fuko, Volja za znanjem – Istorijaseksualnosti I). Transl. Jelena Stakić: Karpos, 2006, p30. Also see: Jefferey Bussolini, “What is a Dispositive? Foucault Studies 10, 2010, pp. 85-107. 14. ↑ Vlaisavljević, p. 50. 15. ↑ Babić, Nikola. Na putevima revolucije. Sarajevo: Svjetlost, 1972., p. 125. 16. ↑ Bilandžić, Dušan. Historija Socijalističke Federativne Republiike Jugoslavije – Glavni procesi 1918. – 1985., Zagreb: Školska knjiga 1985. P. 110. 18. ↑ Petranović notes: “Narodni Front Jugoslavije (NFJ) also comprized bourgeois parties that approached it at the end of the war. Formally speaking, the NFJ’s principles provided for a multi-party structure that would maintain party particularities within the organization and its steering bodies – which was an expression of internationalist tendencies and aspirations to involve all patriotic and democratically inclined citizens in the program of further revolutionary-democratic development – but the significance of such multi-party structure was diminished by other provisions. First and foremost, the existing parties had to accept the NFJ’s program, while their members had to join the NFJ’s local councils. There were some minor elements of coalition, with some exceptions, in the governing structures of the NFJ. The real existing political relations were far more important than the formal aspects of this issue. Ever since its founding, the NFJ built itself as a unique organization of masses that accepted and acknowledged the CPY’s rule. The existing bourgeois groups could not endanger the political solidity of the organization without an external intervention, as they were small and weak. The path toward democratic development, according to the NFJ, did not lead through a multi-party organization, but rather its negation.“ Cf. Branko Petranović, Istorija Jugoslavije 1918.–1988. : Treća knjiga: Socijalistička Jugoslavija 1945.–1988., Belgrade: Nolit, 1988, 43. Mass organizations made an effort to isolate the “non-communist” aspects of their own traditions such as “old trade-unionism” among workers or “feminist deviations” in the AFŽ. The election preparations during the summer and fall of 1945 included “political cleansing” during which “those opposing revolutionary measures were out, and those who would implement these measures more consistently entered government bodies.” Bilandžić, op. cit. p. 104. 19. ↑ Skleivcky, op. cit. p.108; Čupulo Dalibor. “Razvoj političkog i pravnog sistema Jugoslavije u poslijeratnom periodu, 1945.–1968. – Pristup istraživanju i litetatura” PP 7, 1988: 203-204. 20. ↑ Petranović, op. cit. p.57. 22. ↑ Bilandžić, p. 111. 23. ↑ Petranović, p. 79. 24. ↑ Bilandžić writes: “The formation of the modern working class mainly from the ranks of peasantry had actually just begun . Due to its fewness, youth and inadequate involvement in the armed revolution, the great turn of the tide was the direct accomplishment of the working class, but of the Communist Party – its political leadership. However, the working class recognized in this a new revolutionary step that would prevent it from being reduced to a tool of economic power and the political rule of the bureaucratic and technocratic class, which is the direction the revolution would have necessarily taken had it remained based on the old, received ideas and theories.” Bilandžić, p. 207.; Petranović notes: “For ‘selfless work’, one would receive the title of a shock worker. In 1946, labor competition turned into a mass movement that included 60% of workers and civil servants. The press popularized the Stakhanovite movement in the USSR, which in Yugoslavia will bring about heroes of labor such as Alija Sirotanović and his successors. Masses of workers, peasants and especially youth gave breadth to voluntary labor and infused it with enthusiasm.” Petranović, p. 207. 25. ↑ Vejzagić, Saša. The Importance of Youth labor Actions in Socialist Yugoslavia, 1948-1950: The Case study of the Motorway “Brotherhood-Unity”. Master’s Thesis (Budapest: Central European University, 2013). 4. The fact is that almost 60 years of this organization (1941-1988) still remains under-researched. See also: Muhamed Nametak “Uloga omladinskih radnih akcija u stvaranju socijalističkoga društva u Bosni i Hercegovini 1945. – 1952. godine”, Časopis za Savremenu Povijest3 : 437-452. 26. ↑ Petranović, op. cit. p. 81, my italic. 27. ↑ Erak, Zoran, ed. Tito i mladi, Belgrade: Mladost 1980., p. 19. Actions also function as immediate spaces of education and upbringing, even in the most literal sense: during only two actions, Brčko-Banovići railroad and Šamac-Sarajevo railroad, in 1946 and 1947 respectively, almost 22.000 young people were brought to literacy. Nametak, op. cit. p. 446. 28. ↑ Kardelj, Edvard. Quoted from Vladimir Barakić’s speech at a commemoration in February 1979 in Josip Arnautović et al. ed. Edvard Kardelj, 1910-1979, Belgrade: News Agency Tanjug, 1979, p. 29. 29. ↑ Vera Katz, Social and Economic Development of Bosnia and Herzegovina 1945-1953. Sarajevo: Institute for History, 2011, p. 14. On the goals of the five-year plan also see: Babić, p. 131. 30. ↑ For investment, cf. Branko Horvat, Privredni sistem i ekonomska politika Jugoslavije, Belgrade: Institute for Economics, 1970, p. 34; In terms of employment, in 1945 there were 461,000 workers; in 1946, 721,000, that is, 260,000 new workers; in 1947, 1,167,000, i.e. 446,000 new workers; in 1958, 1,1517,000, i.e. 350,000 new workers, and in 1949 1,990,000, i.e. 473,000 new workers and civil servants. 31. ↑ Dedijer, Vladimir. Izgubljena bitka Josifa Visarionoviča Staljina, Belgrade: Rad, 1978, p. 186. Collectivization slowed down only at the end of 1949, following the decisions passed at the CPY Plenum on December 29 and 30 of the same year. 33. ↑ In the first three years of the five-year plan 1,269,000 new workers were employed. The following year registers a considerable decrease. Between 1950 and 1954, only 15,000 new workers were employed, while between 1964 and 1967 the number of employed drops from 3,608,000 in 1964 to 3,561,000 in 1967. Bilandžić, p.114; Horvat, Privredni sistem, p. 27. 34. ↑ Babić, op. cit. p. 134; Bilandžić, op. cit. p. 208. 35. ↑ Horvat, op. cit. p. 11. The new economic system was established in 1952, by replacing central planning with planning of the so-called “basic proportions” (e.g. accumulation rate and distribution of investments), the devaluation of the Dinar, introduction of the market mechanism as the price regulator in most production and commerce spheres, and giving some companies independence, which meant the creation of conditions for the decentralization of the economy. After that, until 1956, work was based on annual plans. 36. ↑ Centralni Odbor of the AFŽ “Postavke o AFŽ-u”, Arhiv Bosne i Hercegovine, Sarajevo, Kutija 8, 63/4, 1949. 37. ↑ Sklevicky, op.cit. p. 97. 38. ↑ Ibid. 97. On reproductive work in general and on some of its contemporary characteristics and linkages to international processes of capital circulation and the restructuration of labor relations see: Frederici, Silvia. Revolution at the Point Zero: Housework, Reproduction and Feminist Struggle. Oakland: PM Press, 2012. 39. ↑ Sklevicky, op.cit. p. 50. 40. ↑ Ibid. pp. 47-51. 42. ↑ Sklevicky, op. cit. p. 55. 43. ↑ Glavni Odbor AFŽ-a “Pismo Centralnog odbora AFŽ Jugoslavije Glavnom odboru AFŽ BiH”. Arhiv Bosne I Hercegovine, Sarajevo, Kutija 1, 1/12, 1945. 46. ↑ Centralni Odbor AFŽ-a ‘Centralni odbor AFŽ-a Jugoslavije Glavnom odboru AFŽ-a Bosne i Hercegovine – o vođenju evidencije raspoložive ženske radne snage’. Arhiv Bosne I Hercegovine, Sarajevo, Kutija 2 711/1, 1947. 47. ↑ Centralni Odbor AFŽ-a, ‘Referat- Plenarni sastanak Sreskog odbora AFŽ-a Bosanski Brod’, Arhiv Bosne I Hercegovine, Sarajevo, Kutija 3, 1554/4, 1947. 49. ↑ Centralni Odbor AFŽ-a, “Centralni odbor AFŽ Jugoslavije Glavnom odboru AFŽ BiH – povodom organizacije 8. martovske izložbe” Arhiv Bosne I Hercegovine, Sarajevo, Kutija 6, 137/1, 1949. 50. ↑ II Congress of the Anti-Fascist Front of Women of Yugoslavia: Belgrade, January 25–27, 1948, 15. 51. ↑ On the socialization of adults see: Ugo Vlaisavljević, Rat kao najveći kulturni događaj: ka semiotici etnonacionalizma, Sarajevo: Meuna-fe Publishing, 2007, pp. 35-50. 52. ↑ For a historical analysis of these processes and their consequences today see: Živković, Andreja. “From the Market… to the Market: The Debt Economy After Yugoslavia” in Welcome to the Desert of Post-Socialism: Radical Politics after Yugoslavia, eds. Horvat, Srećko, Štiks, Igor. London/New York: Verso. 2015. pp. 45-64. 55. ↑ Oblasni Odbor AFŽ-a Sarajevo, Oblasni odbor AFŽ Sarajevska oblast – najava takmičenja u čast izbora za Narodne izbore„ Arhiv Bosne I Hercegovine, Sarajevo, Kutija 8, 4/1, 1949. 56. ↑ In a letter from September 1947, the County Committee of the AFŽ Doboj, notes that the NF did not help with the larger political engagement of women and mentions the dissatisfaction of the female comrades which they expressed thus “if we can labor voluntarily shoulder to shoulder with our male comrades, then we can also be appointed to the councils.” Centralni Odbor AFŽ-a, “Sreski odbor AFŽ-a Doboj Zemaljskom odboru AFŽ-a – izvještaj o radu organizacije za mjesec august”. Arhiv Bosne I Hercegovine, Sarajevo, Box 2, 842/1, 1947. 57. ↑ Centralni Odbor AFŽ-a, Zapisnik sa savjetovanja rukovodioca reonskih odbora AFŽ-a grada Sarajeva – 30.- 31. mart, Archive of Bosnia and Herzegovina, Kutija 6, 776/6, 1949. 58. ↑ Božinović, op. cit. p. 154. 59. ↑ Ibid. p. 154. 60. ↑ Oblasni Odbor AFŽ-a, ‘I Plenum AFŽ-a Sarajevske oblasti održan 22.02.1950. godine – zapisnik’ Arhiv Bosne I Hercegovine, Sarajevo, Box 8, 422/1, 1950. 62. ↑ Božinović, op. cit. p. 165. 64. ↑ Vera Katz summarizes the evolution of the organization’s work as: “a relatively small group of communists managed, through meticulous work on the ground, in wartime conditions and in a very short period of time, to convince large masses of women to aid the partisan war, so they could attain new rights after the war. The program succeeded completely, so much so that the women’s political organizing became a danger to communists soon after the war and the AFŽ was abolished. After that, the ideological turn would survive a peculiar combination of a consumerist-patriarchal model imposed on women, while a majority of the promised rights survived.” See: Vera Katz, “O društvenom položaju žene u Bosni i Hercegovini 1942.-1953.” Prilozi 40 (2011), p. 138. 65. ↑ Božinović, op. cit. p. 170. 66. ↑ Petranović, op. cit. p. 468. 67. ↑ Stojanović, Ivan. Kuda i kako dalje? Zapisi o odnosima i protivrečnostima ekonomije i politike, Belgrade: Ekonomika, 1989, pp. 15-16. 68. ↑ In addition to this highest honor, the Order of the Red Banner of Labor was instituted late in 1968, and was awarded to 245 collectives by the end of 1980. These collectives included teaching, learning and research institutions, as well as self-managed industrial enterprises as well as construction companies. See: Heroji rada Jugoslavije, Belgrade: Zavod za informacione sisteme, 1981, p. 4. Boriša Mraović is a researcher, editor and a member of the operations team at the Association for the Arts and Culture “Crvena”, where he researches the political economy of the urban question, management of urban resources, and urban mobilization. He is currently preparing extensive research on rave culture in Bosnia and Herzegovina 1996–2006. He has published articles in international journals and proceedings, and has edited the volume Šta da napišem na zidu? (What Shall I Write on the Wall) published by “Crvena”. He has won the Open Society Fund Research Fellowship (2013–2014), the ERSTE Fundation Social Research Fellowship (2015–2016), and in September and October 2013 he was guest researcher at the Centre for Democracy Studies in Aarau, Switzerland. He has worked with a number of local and international organizations and academic institutions researching migration, electoral systems, local governance and political theory.